Blue sky, Blue sea and ….. It was very beautiful day in Shirahama today ! During summer we can’t see clear sky and blue sea many times, so they were lucky today. I took this picture on the way to Shimoda for shopping, but there were a lot of people today too. This entry was posted in beach on 2006年8月29日 by izusakuraya. It was a picture that I took 3 days ago….. 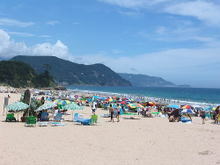 Yes, when I went to Shimoda for shopping I took these picture at Shirahama beach. Actually I was going to post it soon but we are very busy and tired every day in summer, so I couldn’t do it. 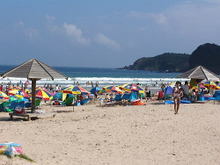 Well, in spite of that Obon holidays were over there were a lot of people in the beach. I took this picture in front of Family Mart. This entry was posted in beach on 2006年8月24日 by izusakuraya. After Obon Holidays it is still swimming season in Shimoda ! 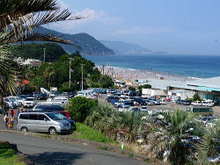 During Obon holidays we had a lot of traffic jam in Izu peinsula, but we don’t hear about it in these days. , they could get to Shimoda after about 4 hours drive from Tokyo. Actually they left from Tokyo at around 4:00 am. 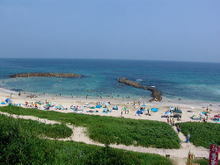 Anyway I could see a lot of people at Shirahama beach today….. 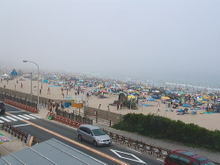 This entry was posted in beach on 2006年8月20日 by izusakuraya. Traffic Jam in Izu Peninsula ! "I have been coming to Shimoda every summer these 20 years, but it was first time to have an experience of the big traffic jam in Shimoda." "It usually takes about 15 minutes by car from Kawazu town to Shirahama, but took 2 hours today !" Our guest who arrived at Sakuraya this morning said so. "Walking was faster than driving on route 135 today." Today was Sunday, during Obon holidays and beautiful summer day, that’s why they had a traffic jam. ….. This entry was posted in beach on 2006年8月13日 by izusakuraya. Before a storm it was the best blue sky today !! Today it was a very beautiful day ! When I was working I found the blue sky, so I went outside and took this picture standing on the roof of Sakuraya’s building. Actually I wanted to go to the beach to take beautiful sea, but I was very busy today.
" It was excellent the blue sea under the blue sky !!" In the summer we can not see a beautiful sky like today, because it is misty even if it is sunny. By the way the typhoon is coming toward Japan, it was a calm before a storm, I think. This entry was posted in nature, Pension Sakuraya on 2006年8月7日 by izusakuraya. "It is prohibited to swim today, so we came back." Our guest who went to the beach this moring said so. "Let’s go to the beach to check the condition !" I went to the beach with my children after job. When I saw the sea from the 2nd floor of Family Mart I could see a looooooot of people and fog over there. 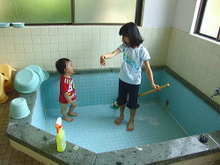 This entry was posted in beach, Family on 2006年8月6日 by izusakuraya. One of my daughter’s jobs of this summer is cleaning up the bath. Yuuki is always following after his sisters and wants to do same things. So when she started to clean up the bath he did it too. So she teaches him how to do it. This entry was posted in Family on 2006年8月4日 by izusakuraya. My daughters, Akari and Hikari caught a cold at last. Because it had been a little cold in these days in the last weekend. So I took them to the hospital in Shimoda. After that I went to Tatado Beach to take pictures. 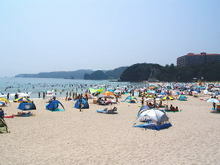 Today it was very hot here in Shimoda, so I could see a lot of people in this beach….. . This entry was posted in beach on 2006年8月3日 by izusakuraya. The rainy season had already been over, but after that, it had been almost cloudy here in Shimoda in these days. 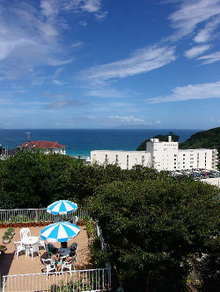 And today, a summer came back again to Shimoda at last. I went to "Shirahama Chuuou Beach" to take pictures under the sunshine. I took this picture from the road on the hill. 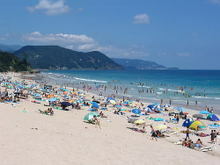 This entry was posted in beach on 2006年8月2日 by izusakuraya.